A Crunchie Clusters package, shimmering in the autumn sun. Like most humans, I like shiny things. While diamond-encrusted teeth and flashy gold chains don’t do anything for me, a pretty, shiny package in the grocery store – especially for a product I’ve never seen before – draws me in like the stupid ape-man I clearly am. No amount of formal education or summer afternoons spent in the library have been able to beat back my primitive brain’s fascination with sparkly food wrappers. Why do I mention this unfortunate fact? 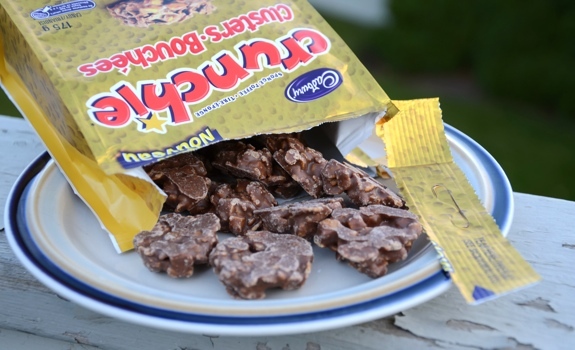 Because the wrapper for new Crunchie Clusters is beautifully eye-catching. It shimmers in even non-studio-quality checkout-lane lighting, its printed gold plastic-foil pouch adorned with cartoonish lettering and an illustration of a chocolate mound of some sort. How could I say no? 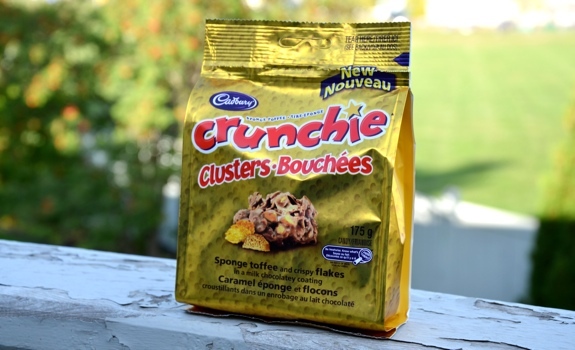 It was prettier than the other packages in the Clusters snack range, and crushed up Crunchie bars seemed like an exotic ingredient. The Taste: Soft milk chocolate gives way to the crunch not just of sponge toffee, but of corn flakes. It’s the sort of snack someone would conceivably make as part of a tin of homemade Christmas goodies. The overall experience is sweet and granular, dissolving to a mushy reside of corn flakes once the chocolate and sponge toffee have melted away. In a twist of logic that may or may not destroy candy science as we know it, the corn flakes make these clusters more crunchy than Crunchie, the chocolate bar. At first, yummy, then odd once the breakfast-cereal aftertaste sets in. Poured out onto a plate, Crunchie Clusters look kind of drab. Cost: $3.99 for a 175 gram bag at Save-On Foods in Edmonton. Value for cash money: Fine. Availability: Moderately widespread. Check your grocery store’s candy aisle. Nutrition? : Per 1/4 package (44 grams): 210 calories, 9 grams of fat, 120 mg of sodium, 1 gram of fibre, 2 grams of protein. The verdict: Curious. Not outlandishly good, yet oddly addictive. I couldn’t stop eating the damned things.